Fifty-one weeks to go until the 2018 Legends Week, and I’m already excited. After all, having dropped 12 consecutive sets this time around, there’s nowhere to go but up. Come on!!!!! Anyway, I mentioned in my closing entry a few days ago that the Friday morning session—an eight-court, moveable feast of a clinic—was, once again, a high point of the week. 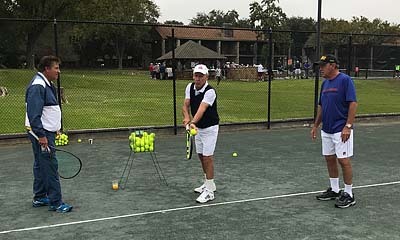 Roy Emerson, working on my backhand. Newk, on my approach shot. Stockton, on my volley. And so on. For two hours, in groups of six or so, we moved from court to court … at one stop, playing doubles “king of the court” and trying not to be paired with the weakest in our group (wait … was that me? ); at another, trying to out-volley ranch pro Thiago; at another, trying to hit a backhand so perfect that Emmo would at least mutter a “not bad” and add your name, rather than the catch-all “Blue” when he wasn’t sure. For the entire morning, a low, overcast sky threatened, but the first raindrops began to fall five minutes before the scheduled close. It was just right. 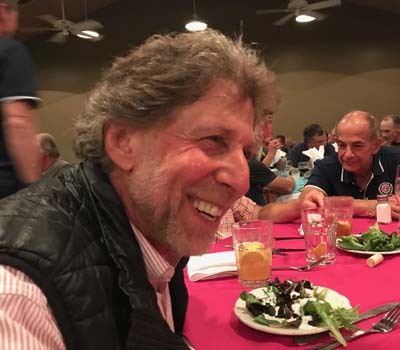 Hollywood agent Mitch Kaplan, at the dinner table. What, you say Roy Emerson has never written a book? It turns out there never was a draft this year. Because of the numbers, it was apparently decided that a player draft would take too long. So the teams were made based on prior knowledge and (for the rookies) self-assessments. Still not clear why Joe and I were separated. 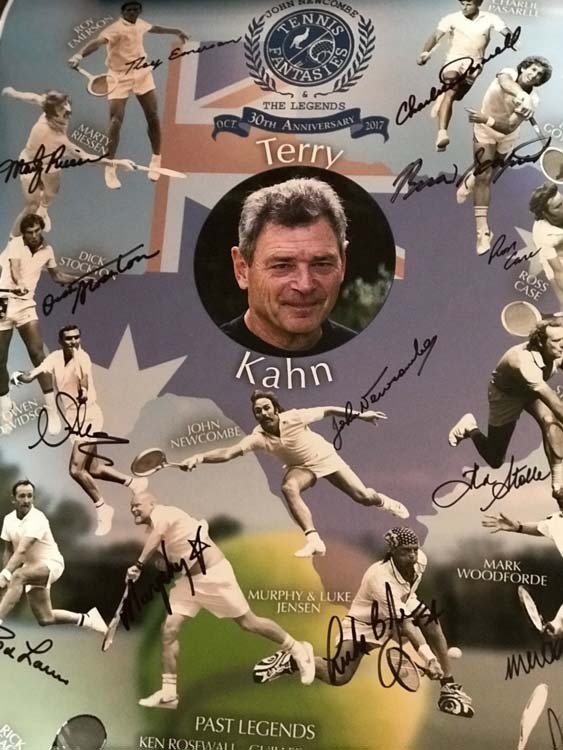 Great swag this year—a white pull-over (which I can wear on the grass at West Side, an amazing frameable poster with not only the Legends, but each camper’s picture centered on it, a large bath towel, lots of other logoed shirts, and a copy of Rod Laver’s autobiography, which he graciously autographed for anyone who asked. I want to thank—and to apologize—to all who had to play doubles with me this week: John Berry, Mark Dang, and Peter Maresco. Not Danie Visser though, although I will concede he had to carry me a bit. (A joke, Danie, that’s a joke.) And to my singles opponents—David Morgan, Tony Jalinek, and Len Saltzman—you’re all seriously awesome. 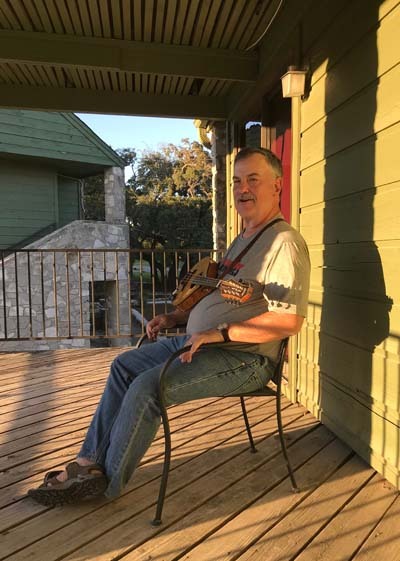 And, finally, thank you Tony Huber for the beautiful mandolin tunes, thank you Mike “Rambo” Rennels for the amazing tutorial on the secret life of major-league senior softball (kevlar armor for the pitchers and infielders! ), and thank you Mitch Kaplan for the inside story on how Hollywood writers (and directors) make their deals. Any of you who want to hit on the grass next year, let me know. 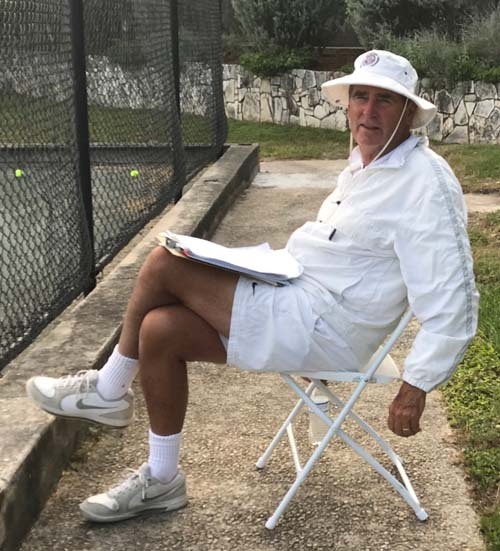 “The sting of my having gone 0-2 in Wednesday’s doubles matches was alleviated somewhat by a pair of late-afternoon clinics with Charlie Pasarell (serve) and Fred Stolle (volley). It’s rather amazing—perhaps it shouldn’t be—that even little adjustments, when pointed out and practiced, can make a big difference in actual play. But they can and they did, at least for me the next morning when I played my best tennis so far this week. Working with both Emmo and Charlie on my serve this week has not made it all that much stronger per se, but my motion is much more consistent now, and I have managed to avoid the dreaded double-fault altogether. You can win a lot of serving games that way. “Two doubles matches lost to teams featuring a strapping 20-something-year-old, as if to remind me how old I really am. In one case, my partner and I fell in straight sets to a father-son team whose patriarch was easily 15 years my junior. Ouch. That afternoon, a different partner and I faced a strong local player paired with one of the ranch pros, a young man named Eric. Eric goes 6’3″ with roughly a 50-foot wingspan and is originally from Rwanda—where they have fewer courts total than Newk has on his Texas tennis ranch, he told us later. Eric could not have been nicer, though. And while only playing half-speed at most, he also tracked down every ‘put away’ shot we made and sent them flying back, often at an altitude of 80-plus feet. Aargh. We managed to tie the second set at 5-all before succumbing 6-2, 7-5. Not bad numbers, really. Just not good enough to add up to a W.
“An hour or so later, my number came up once again, this time when Luke Jensen and I squared off against brother Terry and Legends doubles ace Danie Visser. Luke and I were ahead 3-0 and cruising when he mockingly uttered the dreaded ‘b’ word (bagel). Not smart. Danie for one decided he had heard enough from Mr. Jensen, thank you very much. Terry found his mojo, I began running out of gas, and Luke declined to put away a couple of volleys he could normally crush with either hand (really). Somehow snatching defeat from the jaws of victory, Luke and I dropped a 7-5 tie-breaker, leaving me oh-for-Thursday in match play. “At the bar that night I doubled my usual margarita order. Just because. “Friday morning’s get-away Legends clinics are always a highlight for late-leaving camp. At one point I found myself standing next to Newk as I worked on my overhead smash (a shot that badly needs work, believe me). Impulsively, I walked over to the Aussie HOFer and threw my arm around his shoulder. Newk, I said, in case no one has told you lately, you run a helluva camp. An institution, really. He smiled and thanked me for writing such a nice story about last year’s camp in the Boston Globe. ‘I’m really happy you and Terry were part of this year’s group,’ Newk added, squeezing my shoulder affectionately. I don’t think there’s much more to say, except if you’ve never been to a Legends Week, you’ve really missed it. And no way I ever lose 13 consecutive sets, even if Luke Jensen pussied a couple of put-aways. See you next year.